Jon Truelson, the old codger of the group, came on board with Creamery Station back around 2014. Some of his past projects include Swamp Rat with the legendary blues guitarist Robert Crotty, Elm City Blues Project, Fast Fingers, The WPLR Breakfast Band, The Tempos, The Sharkpool Orchestra, Jordan West & the Whole Shebang, Sunrise, The Leasebreakers, Allen Ginsberg, Ray Bremser, Kathy Kreger, Rod Price among many others over the years. 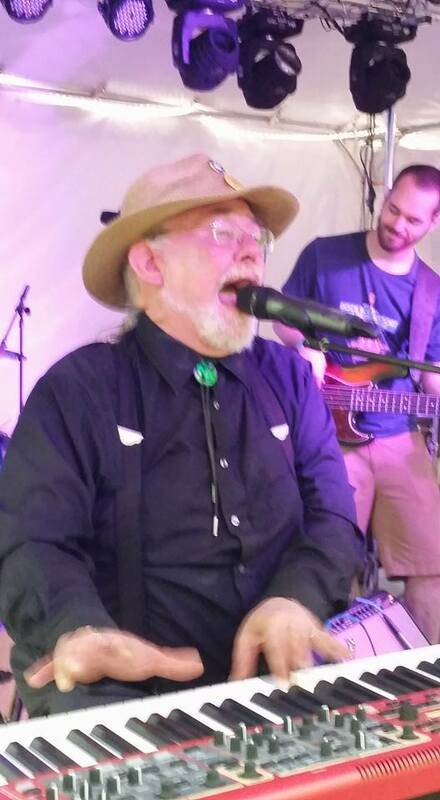 When performing with Creamery Station, Jon plays a Nord 88-key Stage 2 keyboard, Vintage Yamaha SY77 synthesizer, Martin D-18 acoustic guitar and might occasionally frail a 5-string Banjo. Here’s a clip of Jon with The Leasebreakers from their 2010 European Tour. Clips featuring Robert Crotty in one of his last performances with Lynn Mallevolti on flute and Bob Pleines (off camera-sorry Bob…) on harmonica. Artists reception featuring the works of Margo Purple and Mariluise Barz at the Kasbah Garden Cafe, New Haven March 19, 2011.